The Cellometer Auto T4 cell counter has made cell counting simpler and more standardized. A tedious job has been eliminated. Thanks Nexcelom! Our Cellometer Auto T4 has continued to be a time saver and make cell counting less of a headache! Being able to program different cell types is also a great feature. The Cellometer Auto T4 has changed the way I count cells and I couldn’t be happier about it. No more painstaking hand counting using the hemacytometer. Thanks so much Nexcelom! The [Cellometer] Auto T4 is a fast and reliable way to count various types of cells and the option to export directly to Excel allows for easy E-notebook integration. The Auto T4 utilizes bright field imaging and pattern-recognition software to quickly and accurately identify and count individual cells. Cell count, concentration, diameter, and % viability are automatically calculated and reported. The Auto T4 simultaneously calculates cell concentration and % viability for cultured cells stained with trypan blue. Trypan blue viability is a dye exclusion method that utilizes membrane integrity to identify dead cells. The dye is unable to penetrate healthy cells, so they remain unstained. Dead cells have a compromised cell membrane that is permeable to the trypan blue dye. Dead cells are stained blue and display as dark cells in the Cellometer software with bright field imaging. NCI-60 is a group of 59 human cancer cell lines (originally 60) developed by the National Cancer Institute for screening purposes. Isolated from various tissues (bone marrow, lung, ovary, brain, skin, breast, colon, kidney, prostate), the cell lines are used extensively to screen experimental cancer drug compounds and study tumor development. The Cellometer cell roundness setting can be adjusted for recognition and counting of irregular-shaped cells, such as RD cells and activated T-cells. The MCF-7 breast cancer cell line can be very clumpy. 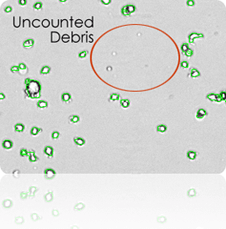 The Cellometer pattern-recognition software identifies and counts individual cells within these cell clumps for accurate analysis (shown at left). 57% of the NCI-60 cell lines are clumpy, contain debris, or display large variations in cell shape or size. All 59 NCI-60 cell lines have been successfully validated on the Cellometer Auto T4 Cell Counter. The Auto T4 Cell Counter Automatically generates a cell size histogram based on cell diameter. Because Cellometer generates individual cell size measurements, multiple samples can be overlaid on one histogram enabling analysis of the change in cell diameter over time. For experiments involving SF9 or SF21 cells, saved images can be viewed and re-counted to analyze changes in morphology over time. The minimum and maximum cell diameter settings can be optimized to count specific cells in a sample. This example demonstrates counting of mature dendritic cells cultured from PBMCs based on cell diameter. No two cells are the same. With the Auto T4 Cell Counter, cell morphology can be immediately viewed on-screen. Counted cells are indicated on-screen for further verification that cells in the sample are being imaged and analyzed properly. Cell images can be archived and exported for use in publications and presentations. Saved images can be re-counted using default or user-optimized analysis settings. Because Cellometer recognizes cells based on size, brightness, and morphology, cellular debris is easily and accurately excluded from counting results. Cell size parameters can be modified to optimize exclusion of debris from results and enhance the accuracy of counting for a wide range of cell sizes. The counted image can be viewed to verify exclusion of debris from results. Counting 1 x 106 cells takes approximately 5 minutes with a manual hemacytometer. Counting live and dead cells sometimes takes twice as long. The Cellometer Auto T4 Cell Counter calculates cell count and concentration for live and dead cells and % viability in just 30 seconds. The Cellometer %CV (Coefficient of Variation), including sample preparation, was well under 5% for most cell lines tested. The CVs for manual counts ranged from 7% to 20%. Automated cell counters remove inter-operator variability and subjectivity from cell counts to generate more precise data. Cellometer Disposable Counting Chambers consist of two independent enclosed chambers with a precisely controlled height. Cell suspension of 20 microliters is loaded into the chamber using a standard single channel pipette. The chamber is inserted into the Cellometer cell counter and the cells are imaged. This simple sample loading and analysis method is ideal for fragile cells. Easily Export to Excel for additional data formatting or sharing. Images and data tables can be pasted into PowerPoint presentations or submitted for publication. Easily Save data and images to a network or local computer. Print directly from the software screen. The standard printout displays live, dead, and total cell count and concentration, % viability, and cell images. Trained Nexcelom Applications Specialists are available for on-site preventative maintenance, IQ validation, and OQ validation. Extended Warranty Available for all Cellometer Systems currently under a valid warranty. Cell Characteristics are based on observation in a Cellometer Counting Chamber. For adherent cell lines, cell characteristics are based on the appearance of cells following trypsinization. Conc. Range: 105 – 107 cells/mlBright field imaging and pattern-recognition software to quickly and accurately decluster, identify and count individual cells. I really like the Cellometer Auto T4! It saves a lot of time and is very convenient for counting cells, requiring very little sample. It doesn’t take up much room either! The Cellometer Auto T4 is small and compact. The cell counts are fast, consistent and reliable. The T4 software is very user-friendly! I like how fast the Cellometer Auto T4 is. You can see pictures of your cells and cell counts within seconds! It makes me confident in my cell counts when I am preparing an experiment. The Cellometer Auto T4 is really awesome! I culture a lot of cell lines at one time so cell counting is time-consuming. This cell counter helps me a lot! The Cellometer Auto T4 provides rapid counting of various cell sizes and cell viability. As a new Research Technician in my lab, I found the Cellometer Auto T4 to be very user friendly. It counted my cells quickly and accurately, which is vital for my cell culture talks required of me weekly! I have really enjoyed using the Cellometer Auto T4. It is superior for determining cell viability of immune cells. We have two Nexcelom cell counters in our lab, a Cellometer Auto T4 and Cellometer Auto 2000. Both cell counters have saved us critical time and are very easy to use! The Cellometer Auto 2000 has been invaluable at helping up with difficult-to-count cells, and even with developing new assays. Both are indispensable pieces of equipment in our lab. After trying our Auto 2000, another lab in our building is purchasing one for their own use. The Cellometer Auto T4 is certainly a lifesaver! I can get through my experiments much quicker, especially when I have numerous samples. It is also helpful when I have a very high cell concentration because I can trust that I am getting an accurate cell count without a lot of effort on my part. I have used the Cellometer Auto T4 for many years, It is easy to use and I have never had a problem with it! It counts cells quickly and saves me a lot of time! We have the Cellometer Auto T4, Cellometer Auto 2000 and Cellometer Vision CBA. Our Cellometers are reliable and every time I call for a product or technical service, I have spoken to a helpful and knowledgeable person. The Cellometer Auto T4 has been very helpful for our mouse studies. It allows us to count cells to determine how many to use for our flow experiments. We have a Cellometer Auto T4. We like it so much we got spoiled and bought another one! No waiting to count! Everyone is happy and loves this machine! The Cellometer Auto T4 has made counting cells so much faster and easier since we purchased the machine. Before acquiring the Cellometer, we had to count using the “old school” hemacytometer which would take a long time. The Cellometer Auto T4 has transformed my cell counting! The time in the TC room has gone way down, and cell viability is always where I want it! I like the Cellometer Auto T4 a lot! It’s so fast and convenient compared to the traditional way of counting. My favorite feature is that you can manually change the cell count numbers slightly if needed. The time savings are priceless with the Cellometer Auto T4. Everyone in the lab says it’s awesome! Wonderful customer service, too! We received thorough training from our Nexcelom rep.
We like the Cellometer Auto T4 for quick cell counts, viability assays, and importantly – we use it to monitor cell volume expansions of T-cells after stimulation. We get good cell diameter measurements, which can useful for volume calculations and more. The Celigo is a great instrument for cell killing assays. Also, the Cellometer Auto T4 allows cell imaging and prevents having to use a hemacytometer which is very nice. This device is an excellent, much faster alternative to other counters. It has enables us to visualize tumor single cell suspensions! I love that the Cellometer Auto T4 can count different cell sizes from a tumor sample! Goodbye hemacytometer! The Cellometer Auto T4 has made cell counting an enjoyable, much faster experience. Plating cells has never been easier and more accurate! The Cellometer Auto T4 is very convenient and consistent. Best product I’ve used in my academic career, and it sure beats the hemacytometer! The Cellometer Auto T4 is very friendly and easy to use piece of equipment – it only took me a matter of minutes to learn how to use it. Also, it gave me accurate results in a short period of time which is perfect to perform experiments fast, and I am able to use it when a short period of time is required based on experiment. The Cellometer Auto T4 is an essential work horse of our cell culture facility. The unit delivers consistent and reliable results, while being remarkably easy to use! The Cellometer Auto T4 is very easy to use. It makes my day less stressful and the staining is quick an easy! The results are timely and help me get my counts in a timely manner. On the Cellometer Auto T4, the saved parameters for different cell types enable me to count different cell types efficiently and without having to manually adjust the conditions for each one. Using the Cellometer Auto T4 has cut down the amount of time spent on counting dramatically! We also tend to find more consistent cell counts than when using the hemacytometer. The Cellometer Auto T4 has drastically improved my efficiency in the lab. The speed and precision with which it counts cells has saved me so much time! It is very user friendly and I would highly recommend it to anyone who does any kind of cell culture work. The Cellometer Auto T4 is very easy to use, reliable and fast! No specialized skill is needed. I have used this instrument for 7 years and never have any problems with it! I use the Cellometer Auto T4 for counting primary cells containing heterogeneous populations of cells. It has been a great help since primary cells contain so many undetectable cells using mechanical cell counting procedure. This allows me to detect the cell sizes of my own interest, which is cancer cells. The Cellometer Auto T4 is convenient to count cells and results are consistent when we compare with a hemacytometer. The instrument automatically excludes Trypan Blue stained dead cells. The Cellometer Auto T4 is a precise and flexible tool for cell counting. Data recording and customizable tools are very convenient. The analysts in the lab really like working with the Cellometer Auto T4 due to rapid results and ease of use! It has good accuracy and the images are easy to read. The Cellometer Auto T4 is very simple and user friendly! It’s especially useful to be able to save different cell lines, so that the reading can be more accurate for different cell lines. The Cellometer Auto T4 is a great instrument to simultaneously calculate cell concentration and percent viability for different kinds of cultured cells stained with Trypan Blue. We have been using regular glass hemacytometer with a coverslip, counting under the microscope for hours and clean it with alcohol before repeating. This instrument is a time saver, period! Live to dead discrimination is perfect for most cultured cancer cell lines. I have not found any difficulties counting with logical cell culture density. I recommend this product for everyone who is looking for a fast and reliable cell culture counting instrument! The software is very easy to use, and results are few clicks away. On the Cellometer Auto T4 I appreciate the automated data recording/log-ins. It has saved a lot of time! The ability to save the images and reanalyze them later is also very useful for reviewing and auditing old data! The Cellometer Auto T4 makes it easier to count the cell numbers so we can save time, especially when having a lot of samples! It also increases the accuracy of our cell count compared to using manual methods. The Cellometer Auto T4 is very helpful as we are able to distinguish the live from the dead cells. I would definietely recommend it! It also has good quality images that makes work easier! I am using the Cellometer Auto T4 as well as another cell counter. I stain with Nexcelom’s AOPI when I use the other cell counter and it works great! I have the perfect cell stain. I love it! The Cellometer Auto T4 provides very quick cell counts and viability checks. The Cellometer Auto T4 is a very reliable device, we use it to count various cell types everyday! The software to drive the Auto T4 already pre-installed some types of cells for you, such as human and mouse cells, and many cell lines as well. The Cellometer Auto T4 is very useful when I have to deal with more than 4-6 samples. Based on some comparison tests with the classic hemacytometer, the machine is quite accurate! The Cellometer Auto T4 is a huge help in performing cell seeding and drug treatment as well as other cell assay related experiments in the lab. The Auto T4 allows us to count the cells very fast and set the cell size parameters. The disposable sample chambers prevent contamination and are easy to use. It also offers the ability to save the data and print it. I use the Cellometer Auto T4 very often and the Celigo Imaging Cytometer occasionally. Having an automated cell counter has made cell counting much faster! The viability determination is an added bonus. Besides the library of cell types, the ability to create a new cell type is easy. The few times I have contacted customer service, they have always been helpful and the replies were fairly quick! The Cellometer Auto T4 is much more convenient than using a hemacytometer. Also, I like how there are many different cell types to chose from! I’ve used the Cellometer Auto T4 for many cell lines and I like it because there are so many options for cell types. The Cellometer Auto T4 is a very easy and reliable technique that we are using for cell viability assays. It’s very easy to handle the instrument, and the sample consumption is low and you can take as many replicates as you want. The software is flexible and gives you a variety of options, such as set the range of diameter of the cells and use the calculator to find the volume needed for desired number of cells based on the cell number you got. The slides are comfortable and can perform two counts on each one. Sample loading is simple and easy to count and you can also save the data generated. The Nexcelom Cellometers are the way to go! They are easy to use and give you cell counts fast. The software for the Cellometer Auto T4 is easy and intuitive. But most importantly, the consumables are very cost-effective relative to competitor products. The Cellometer Auto T4 is a very high functioning machine that operates with high accuracy and precision for measuring concentrations and percent viability for cultured cells stained with Trypan Blue. The Auto T4 meets the claims of reporting within 30 seconds the live, dead, and total cell count, the live and total cell concentration; the mean cell diameter, and the percent viability. I really love the ability and functions where it automatically generates a cell size histogram based on cell size. I love this machine and it is a must-have for our upstream lab! The Cellometer Auto T4 has led to precise cell counts quickly and easily which has revolutionized my workflow and substantially cut down on time in the lab! The Cellometer Auto T4 saves us time and helps us to minimize subjective judgement. At the same time, the Cellometer provides an excellent way to store the results to present and discuss in groups when needed. Our Cellometer Auto T4 is easy to use, quick, and provides comprehensive information about our cells, such as cell counts for alive and dead cells. Having used a manual hemacytometer in the past, I am very pleased with the Cellometer Auto T4. We rely on our Cellometer Auto T4 to count for all the cell counting in the lab! The calculator function is a great tool to have. The Cellometer Auto T4 unit simplifies the counting of a variety of cell types and makes a more consistent counting method, which equals better science and confidence in our data. The system is easy to use and the operation for cell counting optimization and calculations is a powerful aspect of the system. The Cellometer Auto T4 has been a great addition to the lab. It is extremely accurate at cell counting in addition to detecting live and dead cells by Trypan Blue staining. The flexibility of reading cells of various sizes makes this optimal for any laboratory. The software is fast and easy to use! The Cellometer Auto T4 has been an absolute dream! It seems almost too easy to count live cells, compared to the hemacytometer that I was accustomed to. I can now quickly count cells and use the program to estimate volumes of cells that are needed in order to carryout my experiments. I also get clean images of cells to assess their quality and fitness. The Cellometer Auto T4 is very user friendly! We use it mainly for cell count and viablility with our primary T cells. It is vey convenient and fast! Our lab is using the Cellometer Auto T4, and this is the best cell counter I have ever used. You will be able to reach the cell numbers and viability at the same time. You can also set up your cell type to get more precise counting. It is a very good instrument. The new version of the Cellometer Auto T4 counts very fast. We have used the Auto T4 for almost 10 years. I have used three different models on the Cellometer automated cell counter platforms. The all-in-one is easy to use. The Cellometer Auto T4 is the best cell counter by far and works exceptionally well with fast computers. This beats manual cell counting hands down! I have been using the disposable cell counting chambers with the Cellometer Auto T4. Another lab had purchased this unit a few years ago and I just started using the Auto T4 last year. It saves a lot of time and is very convenient for counting cells, requiring very little sample. It doesn’t take up much room either! The Cellometer gives a quick and easy way to count individual cells and also increases the throughput and efficiency compared to manual counting. I am working with 200 different clones that needed to be counted and I am able to get the cell count, concentration and %viability in a fairly short period of time! If I had not used the Cellometer Auto T4 cell counter, I would most likely not have been able to finish counting cells from each clone. Manual counting would have been extremely time-consuming and I would be particularly concerned with miscount errors that affect the accuracy of the cell concentrations. All in all, this instrument has definitely been a life saver for me!